This is a string quintet (a single slow movement lasting about seven minutes) with two cellos, with the added flexibility of a clarinet part to replace the viola part, and a double bass part to replace one cello part. It is lyrical and straightforward to play. Frank Martin was born in 1890 in Geneva, Switzerland, the youngest of ten children, and died in his adopted country, The Netherlands, in 1974. He played and improvised on the piano even before he went to school and by the age of nine was composing children's songs without ever having been taught musical forms or harmony. In 1926 he founded the “Société de Musique de Chambre de Genève” which he led as pianist and harpsichord player for ten years. He also taught at the “Institut Jacques-Dalcroze” and the Geneva Conservatory of Music. In 1932 he became interested in the 12-tone compositional technique of Arnold Schoenberg and incorporated some elements into his own musical language. His compositions include choral and orchestral works, vocal pieces and chamber music. 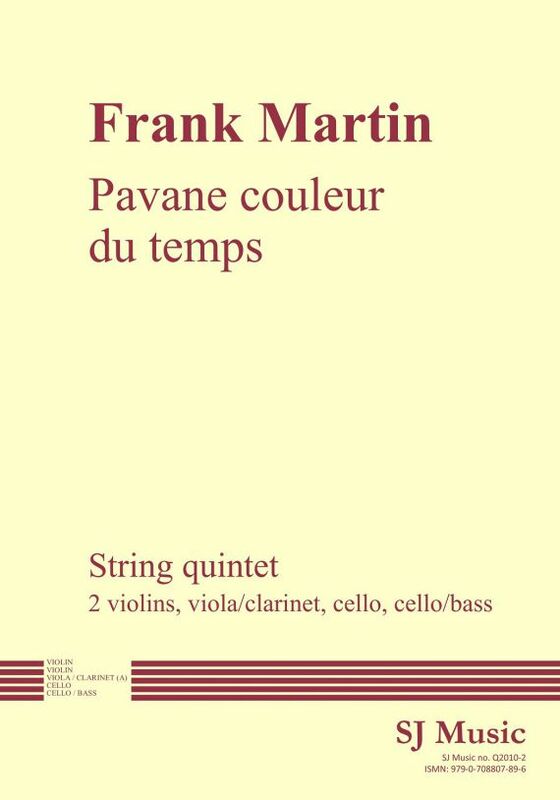 “Pavane couleur du temps” was first composed in 1920 as a string quintet with 2 cellos.Versions for string orchestra and for piano duet also exist.